I dream of a day where I don't have to touch a keyboard. When I'm not trapped in the matrix. Our tenth day of fighting the virus. It still creeps through the network. A pox upon us all. We've thinned the ranks of the victims. But it still lurks in the digital shadows. Sneering at us. Hopefully we'll be clean by the weekend. And then I come home and wade through a tarpit of a domain for a friend. My eyes crossing from all the windows and reports. Sighing at all the rubbish piled in the corners. Tired. Tired. Tired. 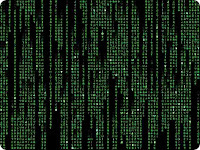 Morpheus, I'll take the blue pill, if you please. Caught a rerun today. Meh. 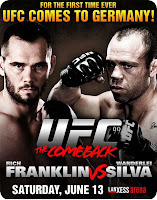 No title fight on the card. And none of the fights really awed me. And the title fight... double meh. Silva was obviously feeling the effects of cutting so much weight for the first time (He had to lose 12lbs?) And Franklin wasn't having one of his best performances. Probably a victory for German. Nothing memorial by UFC standards. Hopefully the next one is worth the price of admission. I loathe putting forth an effort and not making any marked progress. 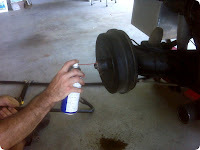 Roger and I tried some new brake drums on the read brakes, but they wouldn't fit on the spline correctly. Had to take them back and get a new set from a specialty shop. Tried to change the transmission oil, but Roger's solution fell short. The Beetle requires a 17mm hex tool to remove the drain plug and the fill plug. You don't find those at the corner store. So I have to order one of those from a specialty shop, too. A drive to Roger's, two hours of labor, a drive home. Nothing to show. I'm defeated. We've been struggling for nearly a week. Slugging it out with a worm. An old one. One that should never have caused us to so much as blink. Let alone force dozens of us to take up arms against. If we'd done our jobs correctly. If we'd tested our plans rather than patting ourselves on the back and presuming we'd be safe. Instead, an unpatched laptop gets infected in the wild and carries its payload behind our corporate firewalls. And the siege begins. Our POS (Point Of Sale) systems weren't patched. Some obscure, all-but-forgotten PCs weren't patched. And other systems not connected to the domain were unpatched. The virus owns them now. We can clean all of them. But down-version systems which can not be wrapped in the latest service pack will get infected again. Sometimes in a manner of minutes. Almost always less than an hour. Day after day we fight the virus. I hear its laughter. We had a late start on the Beetle. Worked on the rear brakes. Had to get new brake shoes, brake drums, and pistons. (The front brakes appear to have been restored previously.) Bled the lines and saw a good bit of improvement. But still not happy. Have to check the front brakes again later this week. (The front pistons may be seized up, like the rear was.) If that doesn't work, the master cylinder needs to be replaced. And at some point we need to change the transmission oil. But the plugs require 17mm hex sockets, and we have to buy one of those. After the brakes and transmission are good, it is off to the bodyshop! Good to be back in my own home with my wife and my kids and my own bed. It was a good trip, no doubt, but I don't relax or enjoy trips as much without Cindy. Anyway, I rolled into the house around eleven PM last night and slept through to eight o'clock this morning. Tried to keep it easy. Some time in the gym, working my shoulders. Out to the pool to help babysit and catch up with Kim K. And then off to Island Strikz, off Pass Road. Two rounds of bowling. A pizza. And a lot of good times. Not as stress-free or quiet as I wanted. But the kids were good. And we enjoyed the time we had together. I'm savoring it while it lasts. Helping out a buddy. Day two. The newness of the environment is wearing off and I notice the little things around me. The antique elevator, for example. 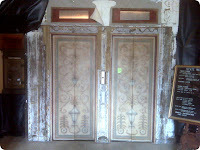 Hand painted doors. Analog floor indicator. Wallpaper slowly peeling further down each day. When the doors finally open, there is barely any room on the inside. I've been in smaller phone booths. The walls have a dark, musky carpet. The floor is bare wood. It is interesting to think that back in the 1960s and 70s there were professional elevator operators. And somebody would have been in this thing at all times. Asking, "Which floor, please?" and pushing the button. Making a living out of that. Day after day. I especially like the buttons. The #1 is off kilter. How long has it been like that? How long before somebody fixes it? If they ever do. We walk half a block to a small cafe for lunch. Local, family owned. A couple of generations of folks working the front counter and bringing out the food. 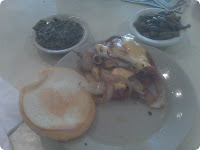 I had a bacon cheeseburger with grilled onions and a side of cream spinach as well as some green beans. Whoooooaaaa was it a fantastic burger. Seriously, top three quality stuff. VERY sizable. Incredibly tasty and obviously seasoned. Onions rocked. Bacon was crispy. And the veggies were dynamite. Aside from a Kobe Beef Burger on a trip to Las Vegas a few years ago, I can't remember the last time I had a restaurant burger this good. Would eat there once a week if at all possible. Certainly on my To Do list next time I'm in town! I like to eat. And when I go out of town, I like to eat interesting foods that I can't get back home. So tonight I GPS'ed some Thai food. Trusting my stomach to a hunk of plastic and its digital logic. Fortunately my first experiment was a success. 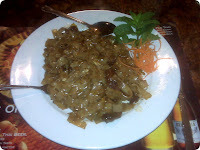 The restaurant (Thai Kitchen) turned out to be a very nice, family owned business. I ordered their Pad-See-U with some Thai Iced Tea. Both were excellent. And the portions were huge. I had enough for three meals! Great food and a quiet experience. Will certainly visit again next time I'm in town. After the main course, I was strolling back to my car when I noticed a pub a few doors down the way. 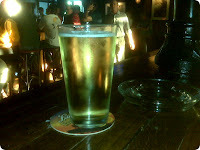 Looked busy and I could use a pint to end the night. Interesting place. Packed to the rafters. So loud I could feel my pulse in my ears. Ordered a tall glass of Woodchuck PEAR cider. The glass and cider so cold my fingers grew numb. Sooooo tasty. Nothing like it on the Coast. And then I noticed it was an almost entirely male crowd. Very few women. And those few were clustered together like lost school girls. Then I noted the odd fashion of the other guys. Leather flip flops. Torn bluejeans with the back pockets ripped off. And shirts just a bit too tight on some folks. With a chuckle, I finished the second half of my glass and called it a night. Odd crowd. I'll sat that much for sure. Okay, this thing is freaking uberimpressive. I'm out of town and can't get a LAN connection anywhere. No 802.11 wireless to be found. Me without connctivity is like Hugh Hefner without a smoking jacket. So I'm itching and jonesing for a fix. 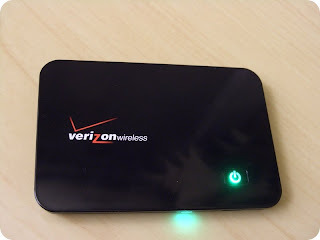 Buddy of mine whips out this Verizon MiFi widget and plops it on the table. It is the size of a credit card, but maybe a quarter inch thick. Push the lone button on the front and it creates a wireless bridge to Verizon's nation-wide wireless network. Suddenly I go from 0Kb/sec to 1Mb/sec! And five people can link to this thing without killing the connection. Wow, wow, and wow! Hot like salsa picante bananna funkystein. Hair of the dog that bit me. And I'm back online. Have to pick up one of these beauties. Highly recommended to everyone in geekdom. It's a digital lifesaver. Must be white boy day. I called Weldshop Ron (my metal fabricator) last week and asked if he could get his hands on some copper bar stock. He asked what I was going to make. I said I needed to replace my 1.5" wide x 1/16th" thick x 8" long steel battery bars with copper so they wouldn't rust and would conduct better. I needed eight bars. He said he'd call me on Monday. So when Weldshop Ron called me today and said he had ALREADY made the bars (without quoting a price,) I freaked. I thought for sure he was going to tell me it would be about $200. (He gives me a good deal when he can. But copper isn't falling off trees.) I met him after his shift and he handed me these clean, beautiful, perfectly cut bars. 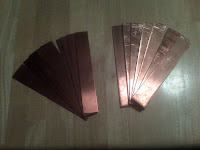 Said a friend had extra copper, so he just cut them to spec and I could have them. Have them? Yeah, just have them. I asked Weldshop Ron how long he spent on it. He said about an hour. I said I wanted to pay him for his time. He said I didn't have to do that. I asked if he'd take $30? He said that would be cool. And that was that. Must be white boy day? The kids have been (mostly) good lately. And Cindy has been babysitting them for the better part of two weeks. So I figured I'd treat everyone to something different. 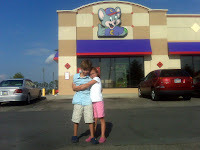 The kids got to pick where they wanted to hang out and Cindy got the night off from the family. Imagine this, the kids picked Chuck E Cheese for dinner. Even though it was barely busy (only one party:) the place was too loud, the prices were too high, the food took far too long to come out, and the salad bar didn't have any Italian dressing. But the kids had a fantastic time at the rat trap. Meanwhile Cindy had wine and nachos and a modified Girls Night at her Mom's house. Bunch of cackling women and too much wine. But she came back smiling. I actually enjoyed spending a couple of hours doing nothing and not being responsible for anything (other than the kids' getting fed and not getting wounded.) I'll have to do that more often. Seemed to recharge all of us. The main "battery pack" on the Beetle contains 13 lead acid batteries. For a total of 156V of combined power going through the lines, over the terminals, and through the battery bars. Two of those batteries are under the back seat. 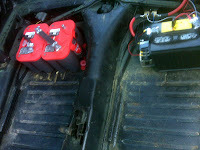 (A lone 12V battery on the driver's side is for all the non-motor electical systems like lights and radio and such.) One of Roger's concerns was that an old iron spring might get too compressed and get too close to a line and the electricity would arc. So we isolated the batteries with a hand-built box made of 3/4" treated plywood. It was Roger's design and my handy work. 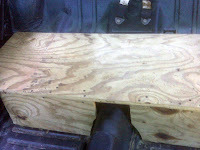 The back seat will sit up slightly higher, but it will have a much better support system under it. And no lightning will arc through that much wood. Once it gets covered by the upholstery guy, it will look like it was made in the factory, as part of the original construction. And I'll sleep better knowing nobody risks a shock in the buttocks. I'm taking a side trip to help out a buddy and spot a quaint little road-side farmer's stand. Fresh fruits and veggies straight out of the Earth and a special treat. Something boiled for my bride. I think this is strictly a Southern thing, too. 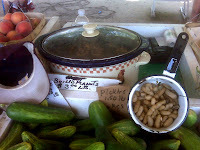 Boiled peanuts! The woman running the stand was simmering them in a crockpot all day. $3 for a pound. Of course she didn't have a scale and "a pound" turned out to be four scoups from a huge ladel. I'm sure it was closer to two pounds. But maybe water-sogged peanuts weigh more and I got the short end of the stick? They weren't for me, anyway. My bride will get a big kick out of them.